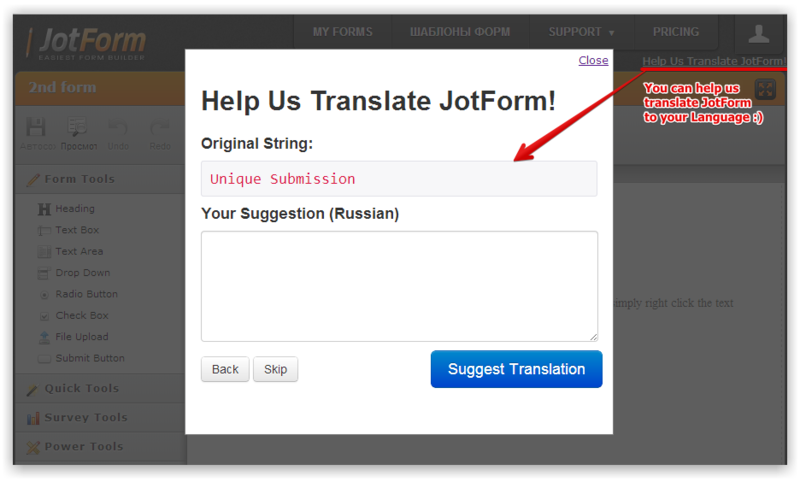 JotForm is now available on many languages. Please see a list of available languages below. If you do not see your language in this list, please download this file, translate it to your language and send it back to us. Do you support double byte characters - e.g. Japanese. If we translate the strings - can you perform this? In which platform this Jot Form made ? can we build rtl forms in jotform? So if we translate the doc in Arabic you'll build jotform in Arabic with correct alignments etc? Ok, but teh fields aren't translated! How to do that, please??? How do I change a form to a different language after it's been built? How to Change Thank You Message Depending on the Language Used? How to Change Email Template Sent Based on the Language Used? How to translate country list in address field to German? The "Captcha" field always appears in English.